FAQ: I am a hotel manager concerned about selecting the best bellman carts, condo carts, and platform trucks known for their excellent performance and for their visual appeal. What are your recommendations? Nothing is more important than the performance and professional appearance of FF&E products in a hotel, especially in the public areas. The good news is that the right furniture and equipment, including carts, can uphold the high level of interior design while providing superior performance, if you choose the manufacturer and the product carefully. 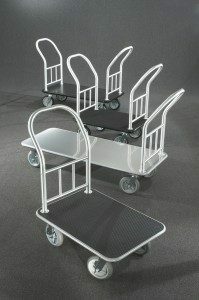 Bellman and condo carts manufactured by Glaro Inc. come in 35”, 40”, and 48” deck lengths. Platform trucks are available in the same lengths as well as in 60” to handle even larger loads. Either is appropriate for facilities with discerning tastes seeking an upscale, professional look for the front as well as the back of the house. In sum, it is important to plan ahead. Select the type of cart based on the primary purpose for which it is intended. When the main purpose of the cart is to move luggage, Glaro Inc. suggests selecting bellman carts or a combination of matching bellman carts and platform trucks. The Glaro Inc. platform trucks are engineered and designed to match and coordinate with the other carts in the Glaro family. Both are available in carpeted and coin design tough vinyl deck covering with a choice of colors. Carpeted models are available with custom logos to promote your brand. If the hotel is a long term residence such as a Condo, a Residence Inn or a senior living facility, a Glaro Inc. condo cart may be the appropriate cart to choose. Condo carts look and feel like a bellman carts; however, they have one or two removable shelves with removable side containment rails. As a result, moving an array of small as well as large items such as groceries, golf clubs, boxes, or luggage is easier with a condo cart than it is with a bellman cart because they will handle a larger capacity of small parcels. Platform trucks are the ideal product for moving equipment and packages of all sizes, shapes, weights, and materials in demanding settings that need ‘workhorse’ carts. When heavy loads are anticipated, a platform truck’s open design and versatility provide the optimal solution for the hospitality industry. Uniquely, Glaro Inc.’s platform trucks offer a high-end design ideal for use in public areas. They beautifully match bellman carts and condo carts manufactured by Glaro Inc. Their heavy duty construction enables them to transport heavy loads (such as refrigerators and machinery) without losing performance. 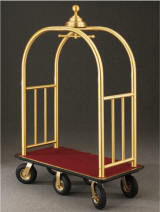 Most hotels keep platform carts on hand to keep daily operations running smoothly. Select the steel, aluminum, or coin design vinyl deck coverings designed for this purpose. Carpeted decks that match the bellman carts are also a fine choice when clean items like boxes, furniture, and supplies are being transported through the common areas. These platform carts/trucks are excellent for setting up ents where moving a lot of different kinds of equipment of different shapes and sizes is necessary.